Under The Radar: Some Pilots Of Small Drones Skirt FAA Rules : All Tech Considered Unmanned drones aren't just a tool for governments anymore. By as early as this year, the FAA expects to propose rules opening small, unmanned airborne vehicles, or drones, for commercial use. Stanford Dish Test Run from BayAreaCrasher on Vimeo. Unmanned drones aren't just a tool for governments anymore. By as early as this year, the Federal Aviation Administration expects to propose regulations opening up the use of small, unmanned airborne vehicles — or drones — for commercial use. Tens of thousands of these little, civilian drones are sold and piloted by hobbyists in the United States every year. Right now these drones are flown almost exclusively for non-commercial uses by enthusiast like Pablo Lema. 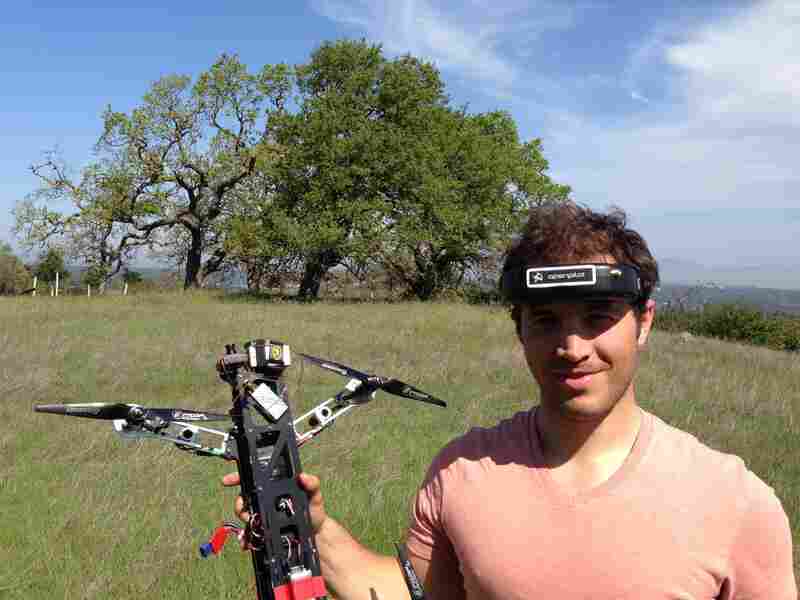 Lema spends weekends flying his quardracopter around the San Francisco Bay. "I don't like to call it a drone," he says. "It is a remote aerial vehicle that I can control wearing some goggles with a camera that records the flight so I can go beyond line of sight. And I use it just for fun — shooting around the bay, doing some fun videos." Pablo Lema shows off his quadcopter. Because Lema stayed away from airports and flew below 400 feet, his flights are legal in the eyes of the FAA. But if he were to use his videos for commercial purposes, he would be breaking the law under FAA regulations. Nick, another pilot who asked NPR not to use his last name, makes money off his flight videos, and is therefore breaking FAA rules. Nick began his career as a photojournalist at a newspaper but quit after seeing many of his co-workers laid off. He later invested in a couple of small 25-pound drones and now makes his living shooting airborne films. Unfortunately, this means he's working in an illegal market. "If this venture falls apart or the FAA comes along and tells me I can't be doing this, I have no idea what I'd do," he says. "It could turn out very badly." While the FAA deems commercial drone flights illegal, many companies look at the positive applications these unmanned airborne vehicles may have, especially overseas. Jonathan Downey, the CEO and founder of Airware, is excited by what these machines can do to help the world. "One of the applications that we're most excited about was a customer that came to us, a conservancy in Kenya that's going to be using a drone very soon for anti-poaching operations there," he says. "They have four of the last seven northern white rhino in the whole world." Airware develops software that can autonomously pilot drones for hours. It's also built so any kind of sensor can be plugged into the drone to help direct it. The drone can then do anything from sniffing the air for chemicals to tracking heat signatures to sense motion. Chris Dixon of the venture capital firm Andreessen Horowitz compares these systems to the Microsoft Windows operating system for computers. "Like Windows, you can plug different devices ... different printers and hard drives or whatever into the hardware," Dixon says. Firms like Andreessen Horowitz and Google Ventures invest tens of millions of dollars in companies like Airware. The next big thing to hit this market, Dixon says, will be the FAA guidelines that will come by 2015. "In 2015, we're expecting some very specific guidelines that balance privacy and safety and commercial interests and a bunch of other things," Dixon says. "Until then, I think it's a lot of gray area." Nick, the commercial drone pilot, is trying to build a business working in that gray area. Although he flies drones illegally, he says he would welcome regulations. "I don't like having to feel like I need to be sneaky or feel like I am a drug dealer or something," he says. "I really love what I do and want it to be a legit business." RC Helicopter Video from Nick on Vimeo.